← How Much Silver is in a Silver Dollar? What is a Troy Ounce, Anyway? 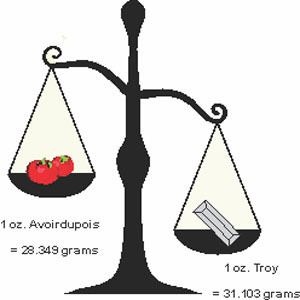 The Avoirdupois (“standard”) ounce versus the Troy ounce. Coin collecting and numismatics can be a cryptic business, often operating in what seems like a foreign language. When it comes to silver and gold coins, some of the terminology surrounding them can get frustrating. “Troy ounce” seems to be a phrase often used in the numismatic world, one whose definition is not always understood. How is a “troy ounce” different from a “regular” ounce? The troy ounce is a unit of imperial measurement that in the present day is most often used to weigh precious metals, like gold, silver and platinum. “Imperial measurement” refers to the British imperial measurement system first truly defined in the British Weights and Measures act of 1824, although former inceptions of the “troy ounce” go all the way back to the private sector of English coinage during the early 15th century. Our “regular” ounce (more correctly known as the avoirdupois ounce) weighs less than a troy ounce. Comparatively, an avoirdupois ounce weighs 28.3495 grams, while the troy ounce weighs 31.1035 grams. Basically, when you get a “troy ounce” of silver or gold, you’re getting more than the regular “avoirdupois” ounce that we associate with weight measurements. In coin collecting, you’ll often come across the phrase “troy ounce” when copy describes the content of the coin. For example, a Morgan silver dollar is 90% silver which is .77344 troy ounces (which converts to 24.0567 grams). That is not the total weight of the coin, but simply the weight of the silver. The U.S. Silver Eagle coin has a total of one troy ounce of silver, giving it one of the highest silver compositions in American silver dollars. It is important to understand all of the tiny details of coin collecting, down to defining and truly understanding the terminology, language, and nuances surrounding it. The more you know, the better a collector you will be! This entry was posted in American, American Silver Eagle, Dollar Coins, Gold, History, Morgan, Numismatic Terminology, Silver, Vernacular and tagged Avoirdupois, Avoirdupois ounce, coin collecting, definition, history, iccoin.com, important, International Coins and Currency, need to know, numismatic terminology, ounce, precious metals, standard, terminology, terms, troy, troy ounce, vernacular. Bookmark the permalink. 3 Responses to What is a Troy Ounce, Anyway?